The installation of grab bars, stairlift or an elevator will allow you to stay in the home you love much longer. When my grandmother had a stroke and was confined to a wheelchair almost 24 years ago, our family was able to keep her in her own home for an additional eight years by renovating. In her case, we moved her bedroom to the main floor and renovated the kitchen to accommodate a main floor fully accessible bathroom. A bath transfer bench, extended shower hose, raised toilet seat and grab bars were just some of the items required to keep her at home the additional years before she finally had to be placed in a local nursing home facility. Twenty-four years later disability elevators are much more affordable. In addition (depending on your home’s layout) it may be cheaper than renovating. For example, if you are simply able to install a lift product, you don’t have to renovate the main floor including costly plumbing. You can continue to use your bedroom and bathroom as you always have. 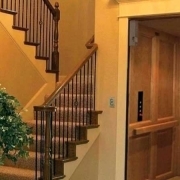 People have always looked for ways to stay in their homes as they age, but with the Baby Boomers’ influential numbers and recent more affordable innovations in technology, home elevators are becoming a very desirable amenity. Your mobility issues will determine whether a stairlift is the answer or if an elevator would be a better choice. Stairlifts are an excellent choice for straight forward mobility issues but if your condition also affects your judgment or may at some point force you to transition into a wheelchair, an elevator may be the answer. Today’s home elevators are sleek and look similar to those you would find in a modern apartment building. I like the use of wood paneling and an elegant wood door to blend in an elevator with the home’s decor. Today’s modern convenience doesn’t have to look out of place in a traditional home. Kimberley Monette is the General Manager at Family 1st Medical. She has spent 24 years in the home healthcare industry. Family 1st Medical is the Maritime Dealer for RAM Manufacturing.